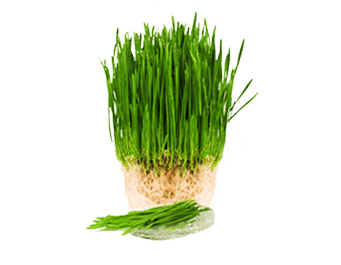 Barley Grass (Hordeum vulgare) contains over a dozen amino acids, including 9 essential ones. It is a very good source of selenium, magnesium, phosphorus and thiamin, as well as being a good source of copper, manganese, iron, zinc, potassium, calcium, folic acid, niacin, pantothenic acid, riboflavin, pyridoxine and vitamin C.
In addition, barley is a rich source of phytochemicals which provide antioxidant benefits and can improve cholesterol, blood pressure and blood glucose levels. Some of the main active constituents found in barley sprouts are saponarin, lutonarin, luteolin, ferulic acid, chlorogenic acid, luteolin-3-7-di-glucoside, hexacosanol, heptacosanol and beta-carotene. Barley is also an excellent source of chlorophyll which helps promote general health and wellbeing. Low in fat, barley contains both soluble and insoluble fiber, aiding the gastrointestinal system, promoting satiety and helping to reduce blood cholesterol and blood glucose levels. Barley is also one of the best sources of β-glucan, a soluble fiber that slows the emptying of the stomach which promotes satiety and helps to prevent a fast rise in blood sugar after eating.